EVA Thermal Cutter to clean laminated glass edges overflowed remains of EVA, PVB, SGP etc. 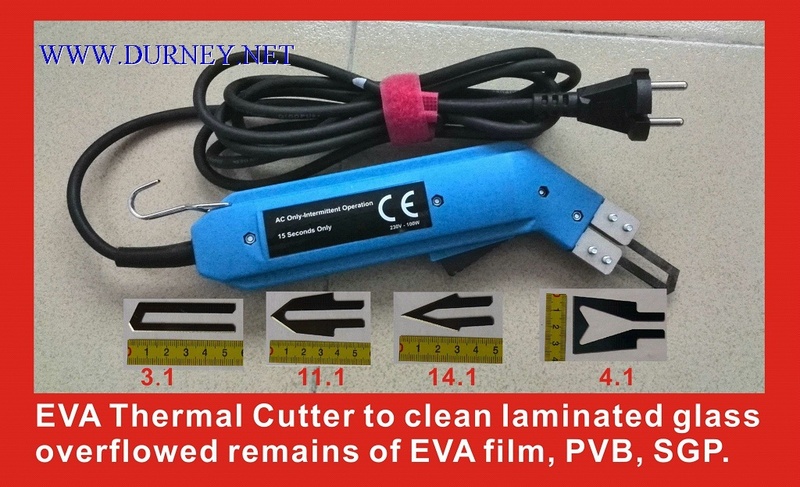 When making laminated glass with EVA film(or PVB film, SGP film) there may be some overflowed EVA remains (or PVB remains, SGP remains) on the edges of laminated glass after heating in the oven, EVA Thermal Cutter is the handhold tool to clean the laminated glass edges remains easily. The blade of the EVA Thermal Cutter can be up to 500℃ in seconds. The EVA Thermal Cutter use the ultra high temperature heat to cut the EVA remains (or PVB remains, SGP remains) of the laminated glass edges. The EVA Thermal Cutter cleans the overflowed remains NOT by strength or sharp, but by Ultra High Temperature Heat: 500℃. So whether the interlayer film is EVA FILM, PVB FILM, or SGP INTERLAYER, the result is the same.